Often referred to as the Spanish St Tropez, Marbella is an exquisite resort on the southern coast of Spain which provides year round sunshine and luxury in every aspect. Combining the very best of traditional and contemporary Spain, Marbella offers a spectacular setting with a luxury marina, cobbled streets and lively nightlife. Marbella is renowned for being a playground to the rich and famous, but it's just as accessible to everyone else too. However, don't expect the bars and restaurants to be run of the mill; in Marbella you'll enjoy the finest food and top quality culinary skills. So much so in fact that Marbella is blessed with a number of Michelin Star restaurants; here's a few you might want to visit during your stay. This award-winning restaurant, run by the most avant-garde chef in Andalucia, Dani Garcia, has the honour of holding two Michelin stars. The youngest chef to receive a Michelin star when he was aged just 24, Dani Garcia has won countless awards for his dishes at Calima. Specialising in new and innovative techniques, Garcia is renowned for his inventive menu and eccentric use of ingredients. Juxtapositioned against this is his deep respect for local recipes and food, and it's this combination which makes such a unique dining experience. Liquid nitrogen cocktails are just the start of the evening's culinary delights and you can expect to have your taste buds titillated in a way that you might not find anywhere else in Marbella. Garcia is one of the country's truly most talented chefs. A collaboration between two top chefs, this Michelin starred restaurant is situated in a particularly picturesque part of Marbella, in the old quarter. A tiny, family-run restaurant with enough seating for just 14 diners, you'll need to book in advance if you want to sample the gastronomic delights on offer. The food here is based on regional recipes, served in a creative way, using only the very top ingredients. Sample dishes include octopus served with potatoes and apple, venison loin with Jerusalem artichokes, roaster rabbit shoulder with mustard and parsnips and a pickled quail and mushroom salad. The décor in this restaurant is bold and contemporary and without question, the centre of attention is their glass encased wine cellar. This is perhaps appropriate because Skina is famed for its particularly excellent selection of wines which complement the cuisine to perfection. 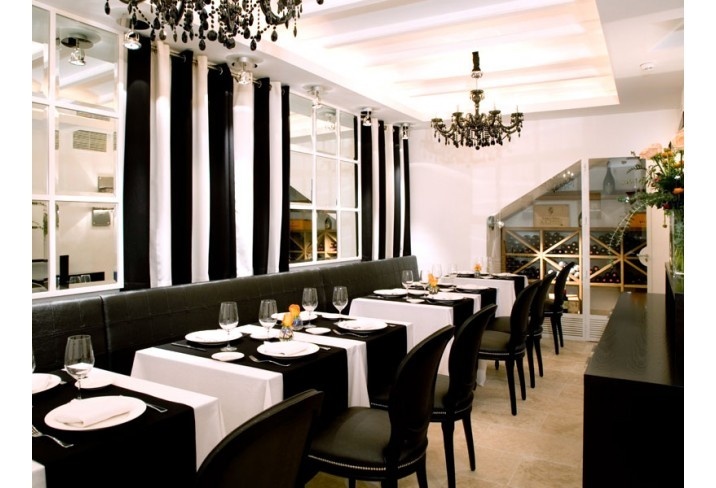 Set in Hotel Claude, this establishment is as far away as you can get from a large commercial venue. A 17th century Spanish townhouse, Hotel Claude has undergone major refurbishment to bring a fascinating combination of the old and the new. Glass lanterns and Moorish arches are offset against a sophisticated monochrome décor in the dining area, with black leather seating and crisp white linen. Only open during the peak summer months, Le Bijou restaurant in Marbella also offers the option of a candlelight meal on the rooftop terrace. The divine food is provided by Michelin-starred German chef Tell Wagner, and focuses on showcasing the local produce from both farmers and fishermen. Expect Mediterranean fare at its very best, with tapas, ceviche, baked fish and vegetarian dishes galore. The menu is more traditional than some of the other Michelin-starred restaurants in the area, but no less high class. An evening at Le Bijou is guaranteed to leave you feeling as if you've dined like a celebrity in an authentic and secluded Andalucian restaurant. But remember, in order to take advantage of what's on offer, you'll need to visit during the summer months. These three top Marbella restaurants offer diners the experience of eating dishes from a Michelin-starred chef or venue. Experience what it's like to sample the very best of what's on offer, with culinary skills that you will never have experienced the like of before. With Michelin-starred restaurants in Marbella just a short stroll from your luxury accommodation, you can enjoy an evening rubbing shoulders with the millionaires, celebrities and film stars who flock to the resort all year round.